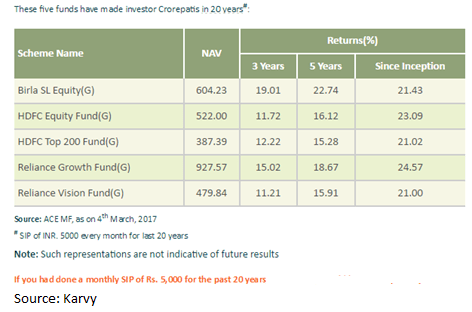 A detailed study by Karvy Stock Broking reveals that if somebody who would have invested just Rs 5,000 per month for the last 20 years in these five funds, you would have earned you more than Rs 1 crore now. This can’t be true! That would be your first reaction. Making money in the stock market is tough especially when you are a working professional and can’t devote much of your time to read company balance sheets, track quarterly results or learn complicated futures & options. The simpler way is to give that money on a regular basis via systematic investment plan (SIP) to a fund manager who would use it to invest in stocks, bonds or other fixed income instruments depending on the choice of plan you have taken. “We believe SIP is a wonderful tool available for investors who wish to create wealth in the long-run. Investors are already aware of the numerous benefits that it offers to them,” AV Suresh of Karvy Stock Broking told Moneycontrol.com. “It makes the best use of the power of compounding and creates huge wealth for investors. Apart from this, it also helps one to sail through different market cycles by investing at different market levels,” he said. If you believe in the power of compounding, then equity markets offer you the best tool to harness such a strong force via mutual funds, which let you create wealth in the long-term. Einstein once said that ‘Power of Compounding is 8th Wonder of the World. He who understands it, earns it … he who doesn’t … pays it.’ Compounding is the first step towards long-term wealth creation. The idea is to remain patient and allows your wealth to grow. When you buy a mutual fund, compounding allows you to earn interest on your principal and then again when you reinvest the interest it helps you build a huge corpus over a period of time with the small amount of initial investment. “You just planted a mango tree and you want fruit tomorrow. Oh no. You just can’t. Similar to your investments. A tree undergoes challenges like pest attack, drought etc. before it yields the first fruit. Similarly, business entities are succumbed to internal and external growth barriers,” Vijayananda Prabhu, Investment Analyst at Geojit Financial Services told Moneycontrol.com. What type of funds should you consider? To generate wealth over a period of time, selection of funds is very necessary. If you get stuck with a wrong fund then chances of wealth creation reduce significantly. Equity funds need a holding period of at least 5 years to avoid negative returns. But the next question is how much to expect from them in the long term. After all, you don’t invest in equity to just preserve capital. “You invest in building wealth. High return expectations, arising from very short-term abnormal rallies in markets, make investors miscalculate what equity funds can deliver. The result? They save less, hoping that high returns will make up for it,” Vidya Bala, Head, Mutual Fund Research, FundsIndia.com told Moneycontrol.com. “Large-cap and diversified equity funds deliver superior returns over prolonged time frames. As seen about, there is a 43 per cent chance of this category delivering returns of over 15 per cent over any 7-year time frames in the past 10 years (rolled daily),” she said. Bala further added that this is simply because, over longer periods, they contain down markets (that would have happened during the period) better than midcap funds. Mid-cap funds’ ability to sustain steady periods of high returns is low at 26 per cent. How to pick up a fund is critical. Some analysts advise investors just to choose a fund manager and the rest will be all taken care of. The market always rewards risk and we know that risk and return always go hand in hand; hence, any short terms should not lead you to discontinue your SIPs. “In mutual funds, it’s not the fund that performs but the fund manager. Just hand pick the top 5 fund managers and choose their consistent funds,” said Prabhu of Geojit Financial Services. “A few things to look for is the ability to protect the downside during volatility, their information ratio (consistency in beating the benchmark) and market experience,” he said. But, we all are aware of one fact that all past performance is not an indicator of future performance. Moreover, with ever changing markets, it becomes quite difficult to predict the best performers for the next 20 years. However, Karvy lists out five funds which have the potential to deliver consistent returns. ICICI Pru Top 100 (G), Birla SL Frontline Equity (G), Canara Rob Emerging Equity (G), Franklin India Prima Plus (G), and ICICI Pru Value Discovery (G).